I have always wanted to be that person that wakes up in the morning, grabs a bunch of healthy fruits and vegetables from the fridge, and then makes a delicious green smoothie. The reality is that I am not this person. I’m too lazy and unprepared. There have been days scattered here and there where I will make a smoothie, but most of the time, I am missing an essential ingredient, or I’m not sure which recipe I want to make, or I’m just too busy getting the kids fed to make anything for myself. I have also made some pretty terrible smoothies in the past, which puts me off from making more for weeks. Instead, I was eating peanut butter toast every day, sometimes three or four pieces of it, and then I would feel bad that I ate so much for breakfast. Logan always has pb toast for breakfast, so it was hard to resist, and the worst part was that I was eating his leftovers, too. After having a baby, it made me feel even worse, because I needed to lose weight, and here I was at the beginning of the day, stuffing my face with all this fatty deliciousness. Then I tried a sample of Amazing Meal Pomegranate Mango Infusion. I was not expecting much. A lot of these meal replacement drinks are sweetened with stevia, which I don’t like. It’s made by a company called Amazing Grass, which again made me think it was not going to taste great. But the package made a lot of lovely claims, so I decided to give it a try. It turns out I loved it. The container says you can mix it with your favorite milk or water. I have found that it’s also pretty good mixed with fruit juices. I typically mix it with Rice Dream, since that’s my favorite milk. There are sometimes clumps left in the drink after I mix it, but this doesn’t bother me. If you want it to be really finely mixed, I think you would have to use a blender or a magic bullet. It doesn’t have stevia or any other artificial sweeteners, it is sweetened by organic cane juice and some questionable ‘natural flavors’. I’m going to let that go for now. I have found that it’s a great way to start my day. I feel more energetic and not weighed down by a heavy breakfast. It is loaded with protein, veggies, fruits, greens, fiber, and other ‘super’ foods. I don’t crave bread in the morning anymore which is a big plus for how I feel and for my weight loss. Amazing Meal is organic, raw, soy free, dairy free, vegan, gluten free, & kosher. It comes in Chocolate, Vanilla, and Original flavors. I haven’t tried any of the other flavors yet because I really like the Pomegranate Mango. I order it through amazon, using subscribe and save, so I get a new thirty day supply every month. What is the first thing you eat/drink in the morning? 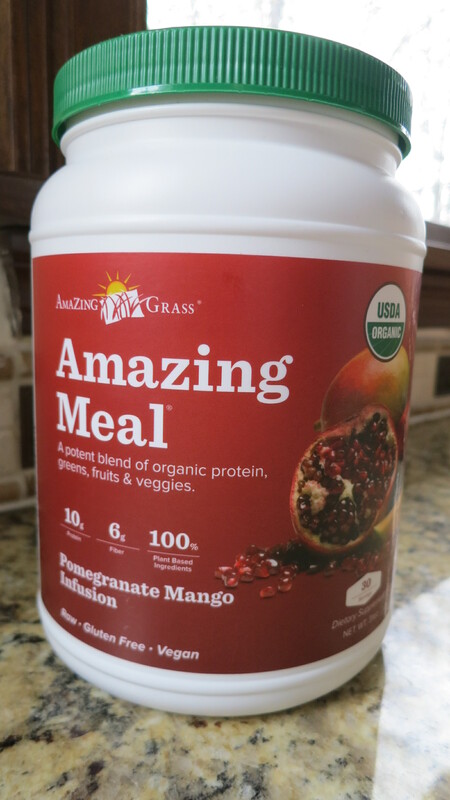 This entry was posted in Favorite Things, Food and tagged Amazing Meal, breakfast, green smoothie, healthy meal, Pomegranate Mango Infusion. Bookmark the permalink. This is exactly what I’ve been looking for — someone I trust to recommend something simple that’s also dairy- and gluten-free. I’m going to check this out. (I was also a pb-addict, especially when I had little ones to fed & tend to. And it put on the pounds so fast! Yikes!) Thanks!! !